In late 2016 he made the news for the wrong reasons - struck by a car after training. Now though, in 2018 he has performed another U-Turn and is back playing footy. After battling ankle injuries previously - he has strung together a solid 8 matches since mid June for St Kilda City in the Southern footy league, including the last 4 in a row making the listed best players. 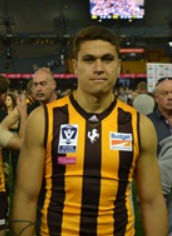 AFLNZ reported earlier this week that former Hawk Tatupu returns to International Footy. He has been named in a large NZ squad with an eye towards the 2020 AFL International Cup. His experience at the Hawks would make him a more than handy inclusion, and at age 22 now, fitness-injuries permitting, with another 2 seasons of footy under his belt he will likely be a formidable proposition for opposing sides.